Summer Camp Leadership: Does Leadership Matter? Often times leaders are given an inordinate amount of the credit or blame for the success or failure of their organization. Changes in leadership are hailed as the cause for the rise or fall of organizations. Unfortunately, in most of these situations it's hard to isolate just leadership as the determining factor. Making the claim that leadership makes or breaks an organization seems at times a stretch. Every once in a while, however, you see examples of the power of a leader. You see a single person who through extraordinary leadership changes an organization. One of those examples was highlighted in college football this weekend. Kansas State University had a long history of ineptitude as a football program. In 1988 K-State named Bill Snyder as head football coach. From 1989 to 2005, Snyder was generally credited with the greatest turnaround in college football history. Wins, bowl games, and national ranking all became commonplace at K-State. In 2005, after a great career, Snyder decided to retire from coaching. The school named its stadium for its much revered former coach. From 2006 to 2008, under different leadership, K-State suffered through three consecutive terrible sessions. Same school, same players, different results. Many of the staff remained the same, but THE leader had changed. Desperate to turn things around, in 2009 K-State lured Snyder out of retirement. What happened? Same school, same players, different results. Amazingly, under Snyder's leadership the K-State football program has been revitalized. Wins, bowl games, and national rankings. 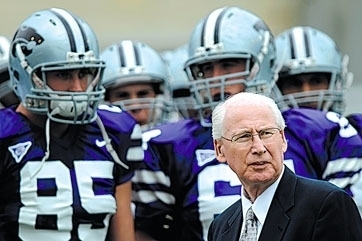 When you think you as a leader can't make a difference, remember the example of Bill Snyder at Kansas State. Remember the power of a leader!